(2013). Evaluation of Casein and Inulin Effects on Droplet Size and pH of Nano-emulsion, Morphology and Structure of Microcapsules of Fish Oil. International Journal of Bio-Inorganic Hybrid Nanomaterials, 2(4), 485-490.
. "Evaluation of Casein and Inulin Effects on Droplet Size and pH of Nano-emulsion, Morphology and Structure of Microcapsules of Fish Oil". 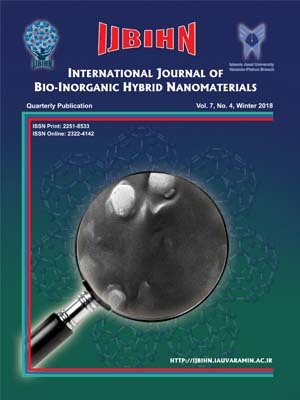 International Journal of Bio-Inorganic Hybrid Nanomaterials, 2, 4, 2013, 485-490. (2013). 'Evaluation of Casein and Inulin Effects on Droplet Size and pH of Nano-emulsion, Morphology and Structure of Microcapsules of Fish Oil', International Journal of Bio-Inorganic Hybrid Nanomaterials, 2(4), pp. 485-490. Evaluation of Casein and Inulin Effects on Droplet Size and pH of Nano-emulsion, Morphology and Structure of Microcapsules of Fish Oil. International Journal of Bio-Inorganic Hybrid Nanomaterials, 2013; 2(4): 485-490. Various compounds have been used for microencapsulating of fish oilso far, but in thiswork for the first time, inulin and casein which are both known for their functional properties, were used as the coating materialof fish oil.This study aimed to investigate the properties of nano-emulsions (droplet size measurements and pH) based on changes in the concentration and type of wall and their effects on the morphology and structure of microcapsuleswere investigated.Microencapsulation of fish oil was done in 3 steps. First,the wall with 5 different concentrations of inulin and casein were mixed with distilled water.In the next step, an ultrasound generator was usedwith an intensity of 24kHz for 120 seconds to prepare nano-emulsions and finally the emulsions were converted into powder in a lab-scale spray dryer.The emulsion pH was measured and emulsion droplet size was examined by a particle size analyzer. The microstructures of the powders were analyzed by scanning electron microscopy (SEM). The results showed that the type and concentration of the compounds used as the wallare effective on the properties of nano-emulsion.Comparing the two compounds and their concentrations demonstrated that caseinhas more desirable properties, as if the lowest size of 95/733nm corresponds to the treatment with 20% casein (p<0.05). Moreover, a significant negative correlation was observed between the size and pH of the nano-size emulsion of fish oil. The comparison between 4% (w/w) and 8% (w/w) fish oil, showed that byincreasingthe ratio of core to wall from 5:1 to 5:2, the size of nano-emulsion significantly reduced (p<0.01).Microencapsulatedparticles containing higher concentrations of casein showed much less wrinkle and depression compared to the samples containing higher concentrations of inulin, because of the smaller size of the nano-emulsions containing higher concentrations of casein. In this study the emulsion droplet size wasat the nano-scale and the images showed the significance of wall material properties and their concentrationsaffecting droplet size and morphology of microcapsules.